Need more time to order Student Replacement Cards? Now you’ve got it! Seeking an Authorized OSHA Trainer near you? Let us help you! The time period that students may request a replacement card has increased from three years to five years. This extension of time is one of the changes that were made to the OSHA Outreach Training Program Requirements. A friendly reminder: if your card is lost, damaged, stolen, or you’ve provided an incorrect spelling that needs to be corrected, a cost of $20 will be incurred. Only one replacement card can be issued per student, so be sure to make it count! While we are flattered to be entrusted with such information, we thought it might be useful to provide guidance on how to properly file a complaint. For starters, here is an OSHA video on filing complaints. Even though you can always call OSHA directly to file a complaint, it may speed up the process to know exactly who you need to contact. There is a map of OSHA Offices by State that can be found on osha.gov. You simply click on the state you reside in and a list of local OSHA offices and/or State Plan offices with proper contact information will appear. North Carolina is one of 22 State Plan States. Complaints can be filed directly to the NC Department of Labor. For more information on how to file a complaint through NCDOL, when a complaint can be filed, what information is needed, and much more, visit the Dept. of Labor website. The Southeastern OTI Education Center is excited to announce the launch of our OSHA Outreach Trainer Search website! 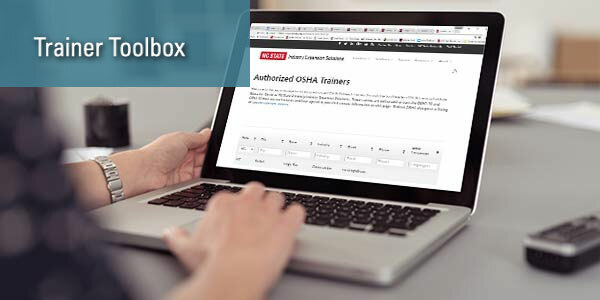 This website was created to make it easier for people to search for and find an authorized OSHA outreach trainer. Not only can you locate nearby trainers, but this website is a valuable resource pulling information directly from Southeastern OTI in real time. For information to be displayed, trainers must opt-in and give permission to be listed on the website. Searches for trainers can be conducted by categories of city, state, industry (construction, general industry, or disaster site), and language. Just a heads up, the page automatically defaults to listing trainers from the state of North Carolina but the view can be changed by selecting another state from the dropdown options.